A John Deere front end loader tackles the residual wood pile at Dapp Power, an Alberta power plant that burns residual wood fibre to produce electricity. The use of residual wood continues to be an area of very high interest for the forest industry, and the Residue-to Revenue Residual Wood Conference coming up in October in Vancouver will feature the latest in wood residue applications and projects. For full details on the conference, and registration information, please turn to page 28 of this issue. (Dapp Power photo by Tony Kryzanowski). B.C.’s policy for wildfire hazard in the wildland-urban interface inadvertently pits communities against forest companies. But a solution is available through a cooperative arrangement which could also help bioenergy industries. An Alberta power plant is proving there is a solid business case for biomass-based power, and it has attracted international investment attention. B.C. wood pellet producer Pacific BioEnergy is meeting the challenge of growing demand with a $24 million expansion and—through energy efficiency initiatives— working with power partner BC Hydro to achieve significant energy savings. Seneca Sawmill’s new $45 million co-gen plant is not only energy efficient and profitable—being fueled by residual wood material—but also offers the company and its mills flexibility in future additional kiln drying of its lumber. Included in The Edge, Canada’s leading publication on research in the forest industry—now incorporated into Logging and Sawmilling Journal—are stories on Canadian Wood Fibre Centre/Natural Resources Canada, Alberta Innovates - Bio Solutions and FPInnovations research projects. Gulbranson Logging, one of the largest logging contractors in B.C., has found a successful equipment formula that includes Waratah processing heads and Hitachi carriers. It makes good business sense—and financial sense—to get the most from the tires on your logging equipment. Logging and Sawmilling has a few tips on how to do exactly that. 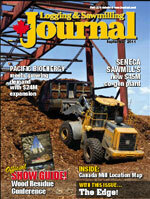 Logging and Sawmilling Journal has the latest information on what’s new in Pellet Mill Equipment. Jim Stirling on how B.C.’s Lakeland Mills is creating new business opportunities with wood-fired bioenergy. The boreal plains forest is one of Canada’s most productive and valuable forests because of the diversity of products that can be manufactured from its wood basket. The Canadian Wood Fibre Centre (CWFC) is showing industry how and where it can capture even more value from this very valuable resource. Representing 10 to 15 per cent of Canada’s entire forest resource, the boreal plains forest consists primarily of aspen, white spruce, black spruce and jack pine. It stretches across all three Prairie provinces as well as the northeast section of British Columbia and the southwest Northwest Territories. The aspen and white spruce are the most commercially valuable species, resulting in the production of softwood, plywood, pulp and paper, oriented strand board, newsprint, and more recently, bio-energy and potentially a variety of bio-products. “This is a really valuable forest type with an ecosystem that gives us the ability to maximize production because we have these two species that have completely different physiology growing in the same conditions,” says CWFC Regional Coordinator for the Prairies, Derek Sidders. These forests progress through four phases during their natural lifecycle: the pure aspen phase, the aspen phase with spruce understorey, the aspen and spruce co-dominant phase, and the pure white spruce phase. Sidders adds that CWFC’s task under its Boreal Plains Mixed Wood Fibre Initiative is to evaluate the input costs of various forest management systems and what the implications are as it relates to product value options and the future marketplace. This allows industry to drill down and focus in on systems that really enhance product options. CWFC uses long-term research test plots representing all four natural successions of the forest’s lifecycle, and has applied a variety of harvesting and silviculture approaches to these test plots. The results are compared to natural control test plots. What’s particularly valuable about these test plots and the research attached to them is that the research data researchers have gathered stretches anywhere from 15 to 60 years. “We are now in a position where we can take advantage of this long history and look at the implications of our management, the impact of our actions on future product options, and management systems that really focus on the fibre attributes and the products and values that can be derived from them,” says Sidders. For example, to present industry with the value proposition of applying various harvesting systems and silviculture practices to specific types of boreal plains forest, CWFC has looked at 11 of its trials sites where partial harvesting systems have been applied. “By tweaking our harvesting practices, we are able to maximize values, access a variety of fibre sources, and sustain the forest by maintaining that mixed wood using natural systems,” says Sidders. In addition to tweaking harvesting practices, CWFC is also conducting an in-depth analysis of what have been the many outcomes of their practices through measurement and destructive sampling of trees on trial sites. The samples are being tested for both chemical and physical attributes, examining fibre lengths, microfibral angle, chemical profile, energy content and density. Sidders says the goal behind the systems management research is not only to potentially add value to the wood basket, but also to achieve greater wood fibre consistency for forest companies. With that very detailed information in hand, CWFC can further assist industry by inputting that data into a Wood Fibre Value Simulation Model that compares input costs with output values so that industry can weigh the commercial potential of putting the ideas presented by CWFC into practice. For more information on the CWFC Boreal Plains Mixed Wood Initiative, contact Derek Sidders at (780) 435-7355 or dsidders@nrcan.gc.ca or Dan MacIsaac at (780) 435-7332 or dmacisaac@nrcan.gc.ca. The need to build partnerships and to manage the supply chain with end products and customer needs in mind were presented as two critical pathways going forward for the Alberta forest industry by presenters at the “Breaking Through” Impact Innovation 2011 seminar hosted recently by Alberta Innovates Bio Solutions (AI Bio). 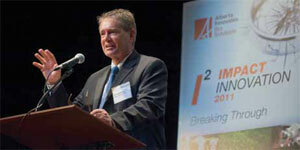 AI Bio Board Chairman Art Froehlich said that innovation is often defined through a very narrow lens. This is one of the major challenges that AI Bio is hoping to overcome as part of its mandate to advance the Alberta bio-economy. Alberta is taking a much broader approach to its innovation system, he said, by leveraging research and development activity among a variety of sectors, specifically bio-solutions, health, energy and environment, and technology futures. The province has significant internal resources to advance its innovation agenda, he added, such as unleashing the abilities of its world class core of engineers who developed right along with the province’s energy industry to help propel the province to the forefront of innovation. “If we all work together through our innovation system, and give it a chance to work, we have an opportunity for this province to become the very best it can be in terms of creating jobs, commercial interests, great science, and also to help other parts of the world with what we have learned here,” said Froehlich. In terms of innovation related to the bio-economy, he pointed out that the forest industry is clearly showing leadership. But by linking forestry’s efforts with agriculture, energy, and the environment, there is potential to enhance and accelerate their greater participation in the bio-economy. Dr. Ken Higginbotham, Canfor Vice-President for Forestry and the Environment, said there has been considerable forest industry innovation already with advances in such areas as computer-based lumber grading systems, the use of lasers and high speed sawing solutions, and that the industry is undergoing transformation because of it. However, introducing and adopting innovative business management systems has perhaps influenced industry innovation even more recently than science and technology. Changes in supply chain management by evolving more toward a ‘market pull’ rather than a ‘product push’ business model has set the stage for the Alberta industry to pursue product innovations in solid wood products like cross-laminated timber (CLT), bio-energy, as well as investigating the 29 technologies capable of producing anything from wood pellets to nanocrystalline cellulose, as identified in the industry’s Future Bio-pathways Initiative. The Forest Products Association of Canada (FPAC), along with FPInnovations, was a major proponent of Future Bio-pathways, which provided the Canadian forest industry with value propositions and implementation strategies for integrating various green product technologies into conventional forestry operations. “Today, we look at the marketplace first and then tell loggers what logs we need, what sizes and what species,” said Higginbotham. “That’s having a tremendous impact on the innovation activities carried out in our traditional business.” As the largest supplier of framing lumber to retailers Home Depot and Lowe’s, Canfor understands the importance of meeting customer expectations. While Bio-pathways presented numerous new opportunities for the forest industry, Higginbotham said it is notable that even Future Bio-pathways acknowledged that for innovation to occur, it is important to have a solid traditional forest industry foundation from which to build. “All of those opportunities in the bio-energy and bio-products require a sawmill in order for them to be economically viable,” he said. For innovation to be successful in future, Alberta’s industry must look at the entire supply chain, and not just mill technology, new products, and tapping into new markets. Industry must search for innovation in its forest resource management, particularly with how the mountain pine beetle epidemic will likely influence annual allowable cuts in future, and the fact that the majority of the cost in manufacturing forest products is harvesting and transporting the wood to production facilities. As companies give greater consideration to production of new products such as bio-energy and bio-chemicals along with traditional forest products, this will have a significant influence on how the forest resource is managed in future. Agreements like the Canadian Boreal Forest Agreement between industry and environmental groups that sets aside more protected areas for better management of species at risk will also significantly influence future forest management decisions. Higginbotham agreed that partnerships will be important in future, particularly as the forest industry delves into unfamiliar territory. “From the forest industry perspective, we don’t have the expertise in some cases, even if the technology is available, so we do need to partner with people who do have it,” he said. Environmentally-friendly transportation fuels can be made from renewable forest biomass. However, the pathway to economically producing biofuels from wood is a longer term opportunity. FPInnovations has suggested a possible way forward for the Canadian forest industry. Bio-diesel is already made from oil crops and waste cooking oils, but it can also be made from residual wood fibres. The chemical processes to transform residual wood fibre to biofuels are well known. 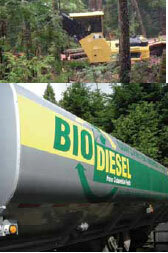 For bio-diesel, the conversion choices are likely to start with either gasification or pyrolysis. Singbeil was among a group of FPInnovations scientists who produced a document called the Bio-energy and Bio-chemicals Synthesis Report in November, 2010 as part of the Canadian forest industry’s Future Bio-Pathways Initiative Phase II final report. It provided information on the various opportunities related to the production of bio-energy and bio-chemicals from forest biomass. Singbeil says the economics of how to collect residual biomass from the forest, process it, and deliver it to a central site where it can actually be transformed are amongst the most significant challenges facing the industry. The Bio-energy and Bio-chemicals Synthesis Report emphasizes that integration of conventional forest product operations with biorefineries offers the greatest potential for success. Taking the highest value out of the wood at each step along the way is the key. Singbeil points out that bio-diesel is only one of many possible products that can be produced from residual wood. By using the gasification process to break down the wood into its component molecules and then passing them over a catalyst, companies can re-assemble the molecules to produce new products. The advantage of producing bio-diesel this way is that a synthetic diesel fuel can be made that is chemically identical to petroleum-based diesel. Bio-diesels produced from grain or waste oils have different properties than commercial diesel fuel and need to be blended for optimum performance in all conditions. Other potential fuel products include ethanol, methanol and dimethyl ether (DME). Pyrolysis oils are also potential starting points for the manufacture of ‘drop-in’ biofuels. Using the pyrolysis process, oil is created by rapidly heating wood for a short time to produce higher molecular weight vapors that are then quenched and recovered as a liquid. With suitable modifications, these oils can be sent directly to a conventional refinery to make green biofuels. Singbeil cautions that there are still many technical challenges to be solved before these processes can be considered commercially viable. The Future Bio-pathways report suggests taking, “a step-wise approach, beginning with smaller commercial applications attached to existing infrastructure.” This approach will serve two purposes—to prove concepts and to develop markets. In the meantime, FPInnovations is working hard to pull together all the pieces of the puzzle. In addition to their work on integration of biorefineries and production of novel bio-products, the institute has completed a field study with Natural Resources Canada on the use of bio-diesel in off-road machinery. Other projects are helping to improve the economics of delivering residual forest biomass. FPInnovations’ PIT program for trucks is just the latest step in its efforts to improve fuel economy and reduce greenhouse gas emissions from industrial transportation fleets. The path forward includes the need for the Canadian forest industry to seek partners because it is highly unlikely that it will be able to accomplish integration of profitable bio-energy and bio-chemical endeavors alone. Singbeil adds that there are examples of companies within the petroleum sector showing interest in partnering with forest companies. “I think there are natural synergies between the two,” he says. While energy companies are experts in producing fuel, the forest industry knows how to harvest, transport and process wood efficiently. For more information related to FPInnovations’ research into using residual wood fibre to produce biofuels, contact Doug Singbeil at (604) 225-5811 or douglas.singbeil@fpinnovations.ca.